Sapper W. Pacey's medal index card. 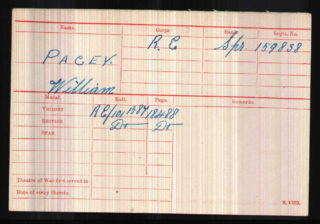 Billy and Edith Pacey's entry in the 1939 register. William and Edith at Penfold House, their home in Ashbourne, 1950. From the private collection of Mr Bill Pinfold. Rachel Pacey (standing, left), Joy Pinfold and Nev Pinfold visiting the Harby's cottage by Fleming's Bridge, Bottesford, circa 1930. 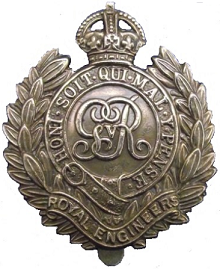 William Pacey is one of the men named on the Bottesford ‘church list’ of WW1 Servicemen. William (Billy) Pacey was born in 1897 at Woolsthorpe by Belvoir, Lincolnshire, and christened on the 10th October. His parents were William Pacey, an ironstone labourer born in 1868 at Woolsthorpe by Belvoir, and Hannah A. Pacey, born 1869 at Great Gonerby, Lincolnshire. William senior and Hannah (born Frances Ann Clay) were married in 1889 at Grantham. 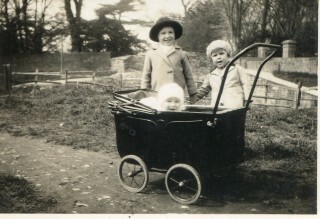 In 1891, William and Hannah lived on Mill Lane, Barrowby, with baby Frederick. They were to have a large family. In 1901, when they lived back at Woolsthorpe, William senior was a ‘plumber & grazier’, beginning the family plumbing business. By this time they had seven children: Frederick (10 years old), Charles (8), Frank (6), Sarah E. (5), William (3), Henry (2) and Walter (less than a year old). By the date of the 1911 census, they had moved to 4 Easthorpe Lane, Bottesford. Charles Pacey had emigrated to Canada, but Frederick, Frank, Sarah, William and Walter were still living at the family home, together with two later children, James (8) and Albert (6). William junior was thirteen years old, and was already learning with his father’s trade, working as a plumber’s assistant. But there is no information to link either of these to the man from Easthorpe. William Pacey married 25 year old Edith Harby, daughter of Henry Harby, on the 26th January, 1924, at Bottesford. At some point, they moved to a cottage, possibly the gatehouse lodge, at Stapleford Park, near Melton Mowbray. They had three children: Rachel Frances (born in March 1925 probably in Bottesford), Alec (b. December 1928, probably at Stapleford) and Gwendoline (b. 25th April 1931, probably at Stapleford). 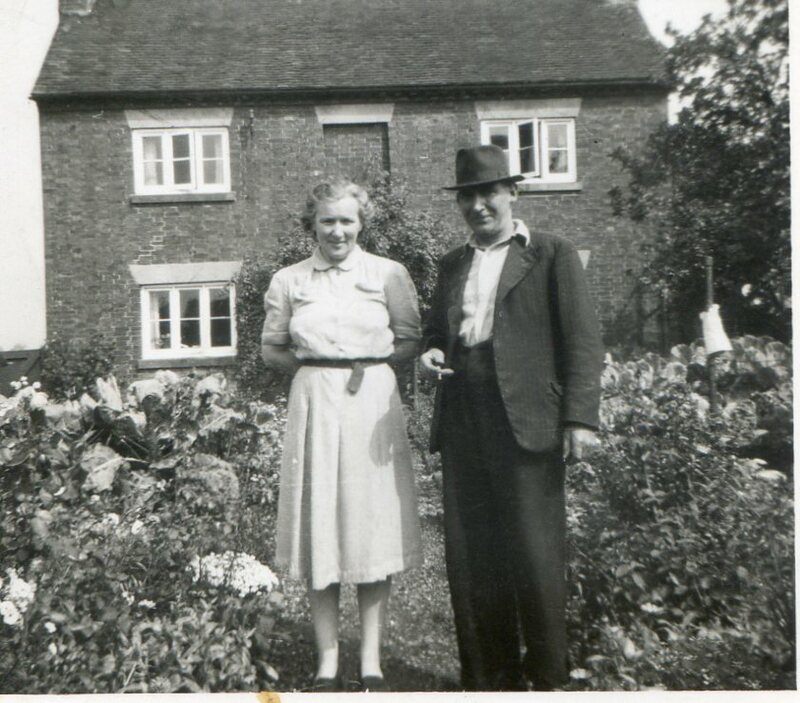 The 1939 Register confirms that a cottage at Stapleford Park, near Melton Mowbray, was the home of William Pacey, an estate plumber born on the 22nd June 1896, and his wife Edith Pacey, born on the 3rd December 1898. Stapleford Park was (and still is) a large private mansion and estate, which might well have required its own plumber. The date of his birth appears to be inaccurate. Later on, they moved to Penfold House, an address in Ashbourne, Derbyshire. 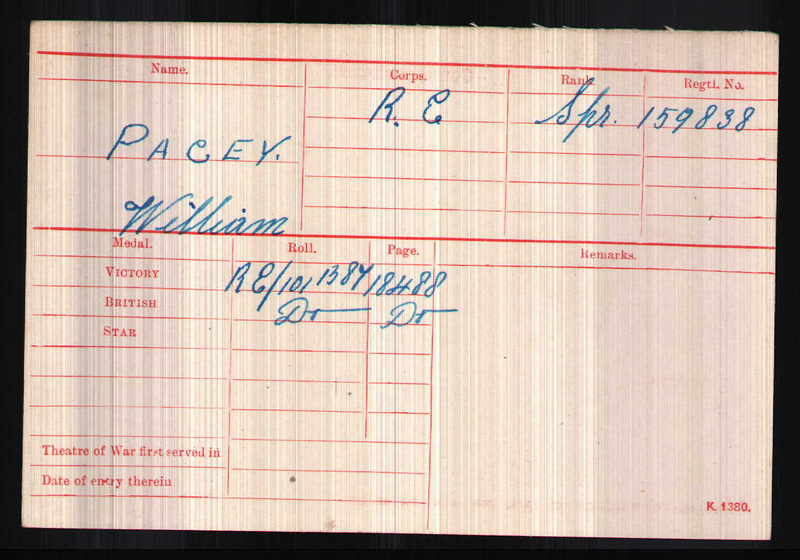 William Pacey died on 20 January, 1959, at Ashbourne, when he was 61 years old. After this, Edith Pacey moved to Clacton, Essex, to be nearer her daughters. and died at Holland-on-Sea, Essex, on the 10th March, 1965, aged 65. We wish to acknowledge that our enquiries have been assisted by information provided pers. comm. by Mr William Pinfold, and set out in the Pinfold-Harby3 public family tree (Ancestry.co.uk).